What is WHO Doing About Health? The World Health Organization, headquartered in Geneva, Switzerland, is one of the original agencies of the United Nations and acts as a coordinating authority on international public health. The WHO constitution states that the organization’s objective “is the attainment by all peoples of the highest possible level of health.” Its major task is to combat disease, especially key infectious diseases, and to promote the general health of the people of the world. Poster, Health is more than the absence of disease. 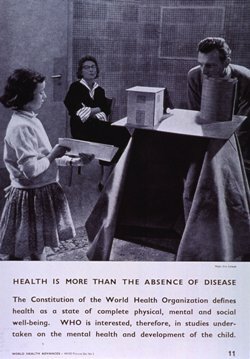 Geneva, Switzerland: World Health Organization, Division of Public Information, 1958. May 1, 2009 in Collections.